This course assists educators in preparing for teacher evaluations in this era of increasing accountability. The four basic teaching styles: Knowing, Caring, Inventing, and Inspirational Teachers are explained. Respecting the unique gifts and styles that each teacher brings to the classroom is essential for objective evaluations. Educators will test themselves and learn about the positive or limits of each of the teaching styles. Teachers will study their districts Teacher Evaluation Policy Manual to prepare for their upcoming evaluation. They will develop an action plan utilizing the book content and evaluation manual to improve their instructional deliver and teaching methodology. Educators will review the standard "Clinical Supervision" models historically developed by most school districts and how they are utilized in teacher evaluations. Teachers will test themselves and explore their preferred teaching style and then evaluate how they must also incorporate other teaching styles into their classroom. Educators will be presented with the characteristics of the Knowing, Inventing, Caring, and Inspiring teacher for a broader understanding of other teaching styles. Educators will learn about the characteristics of generational poverty and how the patters of behavior, problems and world views are passed to future generations. 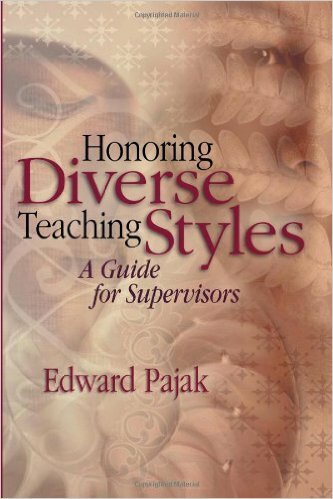 Supervising educators will examine their own preferences in light of objectivity when evaluating other teaching styles in order to strengthen instructional practices. Educators will examine their school districts teacher evaluation policy manual in order to develop an action plan to prepare for the teacher evaluation process.